Launched February 10, 2004, Flickr is an online photo management and sharing resource for a wide range of people from amateur photographers to professional institutions. Over its fifteen years of existence, Flickr has evolved from a photo sharing site into the social media outlet it is today. There are a lot of tabs to go through so lets get started! In order to begin you need a Yahoo account. Do not worry if you do not have one, simply use your personal email (Gmail, Outlook, Hotmail, etc.) and Flickr will translate it into a Yahoo account for your login or you have the option to create your own Yahoo account if you prefer. Once you fill out all your personal information (name, email, password) and enter the confirmation code sent to your email you are ready to get started sharing your photos. When you first login your are sent to the Home page, where you can start exploring your photo interests by looking through all Flickr activity, people and groups. To upload, click the cloud-with-arrow icon (hencforth to be known as the “upload cloud”) in the top right corner of the page. 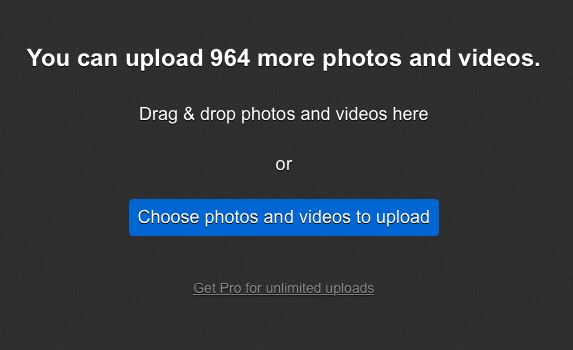 This will lead you to the upload page where you can either click “choose photos and videos to upload” or drag them from your desktop. Once you finish dragging your photos onto the site you can rename, tag, change privacy settings, and make other small adjustments before clicking the blue Upload button. When your photos are uploaded you will be sent to your Photostream page. At the top left of every page are your main drop-down tabs; You, Explore, Create, and Get Pro. The You tab brings you to your personal page and functions like a blog Dashboard. From here you can access your About page and view your Photostream, where you were sent after uploading your photos and basically the library of the photos you have uploaded. You can put together Albums, view your Faves or favorite photos you have found while looking through Flickr. You also have the option to edit and create Galleries, which are different from Albums because they are made of your “Faves” photos instead of your photos. You can view Groups you are a member of or create Groups and discussions. The Stats tab is for Pro members and it allows you to track which of your photos are trending. The Camera Roll tab is where you can edit the privacy settings of your photos. Back to the top left tabs, the Explore tab leads to Trending and the Best Shot of 2018. Explore is similar to the Flickr Home page because it also presents you with multiple photos that may or may not interest interest you. The Create tab at the top leads to Blurb, which is a photobook application partnered with Flickr. 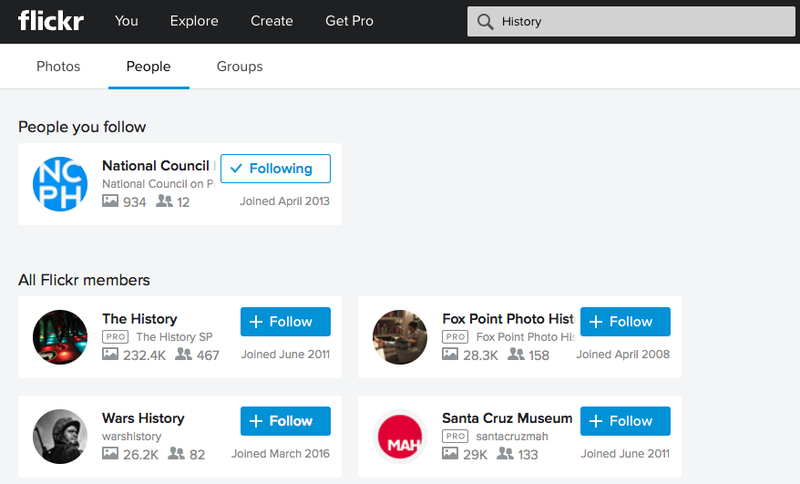 The Get Pro tab is the startup page for Flickr membership plans. Instead of having a free account you can set up an annual or monthly payment plan that comes with special benefits. By using the search bar, located on the right top side of the screen near the upload cloud, you can look for photos, people or groups. 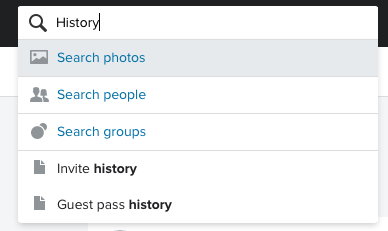 For example, searching “History” will result in multiple images, organizations and groups. You can decide to Follow People or Join a Group. The pages for People are set up the same as yours, but Groups have some differences. In a Group, discussions can be facilitated. In the case of Flickr: History Group, discussions involve interactions between members conversing on different subjects, ranging from specific dates in history to time travelling. This is a great way for members who are not photographically inclined to participate in dialogue on Flickr. Flickr allows verbal and visual communication between its users. Whether they are sharing their art or conversing over subjects of common interest. It is a common ground between amateurs and professionals to share visions.